With its emphasis on balance, freshness, light proportions and a minimal use of oil, Vietnamese cuisine is one of the healthiest and most aesthetically pleasing cuisines in the world. All five taste sensations - spicy, sour, bitter, salty and sweet - are evoked. And, in addition to being a feast for the eyes, the cuisine utilizes aromatic spices to stimulate the nose, crisp ingredients to engage the ear and finger foods to include the sense of touch. Common ingredients include fish sauce, shrimp paste, soy sauce, rice, fresh herbs, fruits and vegetables and chefs rely on lemongrass, ginger, mint, Vietnamese mint, long coriander, Saigon cinnamon, bird's eye chili, lime and basil leaves to build complex layers of flavor. To learn about Vietnamese cuisine is to delve into the nation's history and culture. Going through long phases of war and political conflicts, as well as cultural shifts, the vast majority of the Vietnamese people have been living in poverty. Therefore, the ingredients for Vietnamese food are often very inexpensive but nonetheless, the way they are cooked together to create a yin-yang balance make the food simple in look but rich in flavor. Nuoc mam (fish sauce) is the most commonly used and symbolic condiment in Vietnamese cooking. It is made from fermented raw fish, and is served with most Vietnamese dishes. Each region of Vietnam has its own culinary style with the traditional southern Vietnamese meal using the fresh ingredients that only the fertile Mekong Delta could provide, such as ca loc (snakehead fish), and a wide range of tropical fruit, such as mangosteen, mango and dragon fruit. You'll get acquainted with Vietnamese food preparation on this intriguing tour beginning with a visit to the Ben Thanh Market to shop with your chef for the freshest ingredients. 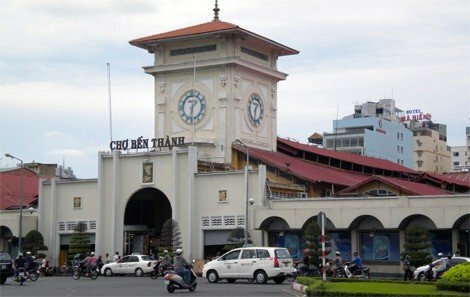 Ben Thanh Market is one of the earliest surviving structures in Saigon and one of the most recognizable symbols of Ho Chi Minh City. 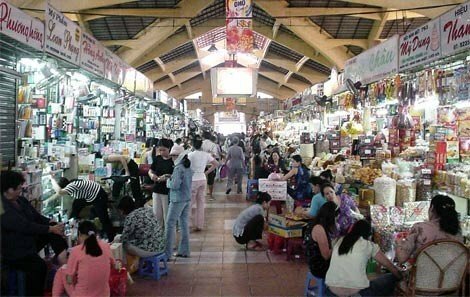 The market was created by informal street vendors who gathered near the Saigon River. At the Grand Saigon Hotel you'll come together to cook and enjoy the fruits of your labors. The menu for the day will provide hands-on experience for a three-course lunch centered on the creation of a Vietnamese spring roll and its dipping sauce. Enjoy the camaraderie of your group, the beautiful restaurant decor and music and dance performance! Accompanied by a selection of Vietnam's favorite local beer, your cooking class and tasting experience will delight all your senses. And the roundtrip drive through the sights and sounds of Ho Chi Minh City to the port, introduces you to the city's many treasures.